BMSvision (previously known as BarcoVision) will exhibit at NPE 2012 in Orlando in the West Hall, Level 2, Hall B on Booth 3683. BMSvision will show the latest version of its PlantMaster Manufacturing Execution Systems (MES) for injection molding, blow molding and extrusion, all based on wireless data collection technology. All of these systems include software modules for real time production and process monitoring, production scheduling, Statistical Process and Quality Control (SPC/SQC) and traceability. A new version of the report generator now allows the combination of real time data and history information in the same report. BMSvision will also present its EnergyMaster system for monitoring and reduction of the energy consumptions and for reporting of the CO2 footprint of the company. Energy has become a very important cost element in plastics manufacturing. Following the principle of Monitoring & Targeting (M&T), EnergyMaster maps the different energy consumptions (electricity, water, gas, compressed air, steam, …) for further analysis and optimization. The integration of these energy parameters with other MES-applications, such as machine and production monitoring, provides a perfect insight in the relation between energy consumption and production (SEC or Specific Energy Consumption) and allows quick identification of energy saving potentials. The new Management Dashboard module (see image) allows the combined presentation of any data available in different BMSvision software modules into a single web based report. With this tool, each user can create his own dashboard showing all important KPI’s at a glance. 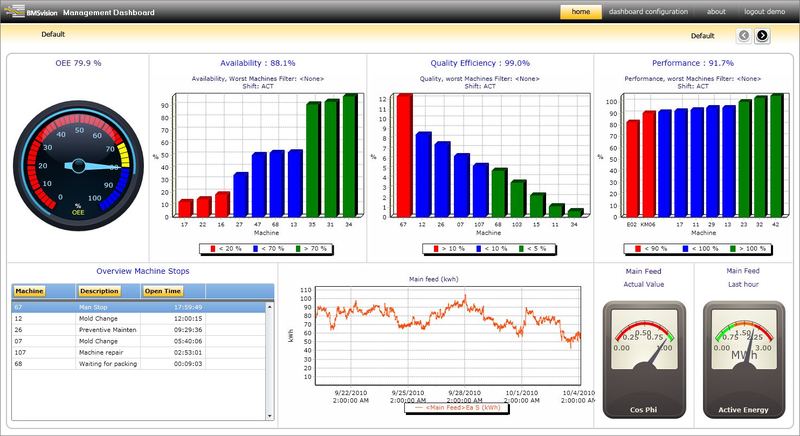 As such, the manager can have all important information regarding efficiencies, quality and energy consumption displayed in real time on one single screen. Zooming functions allow him to dig into any further detail if required. You can read more about the BMSvision products and systems on www.visionbms.com. BMSvision, established in 2007 as a carve-out from the Barco group, is a leading supplier of Manufacturing Execution Systems (MES) for discrete manufacturing, with focus on the textiles, plastics and pharmaceutical industry. With over 30 years of experience as a former division of the Barco group, BMSvision offers a wide range of systems aimed at productivity, quality improvement and energy management. BMSvision is present at key locations around the world, either with own branch offices or through a world wide network of agents and service centers.